The microbivores are a group of animals that operate alongside the detritivores, and which can be difficult to distinguish from them. The name microbivore is reserved for the minute animals that specialize at feeding on microflora, and are able to ingest bacteria or fungi but exclude detritus from their guts. Exploitation of the two major groups of microflora requires quite different feeding techniques, principally because of differences in growth form. Bacteria (and yeasts) show a colonial growth form arising by the division of unicells, usually on the surface of small particles. Specialist consumers of bacteria are inevitably very small; they include free-living protozoans such as amoebae, in both soil and aquatic environments, and the terrestrial nematode Pelodera, which does not consume whole sediment particles but grazes among them consuming the bacteria on their surfaces. The majority of fungi, in contrast to most bacteria, are filamentous, producing extensively branching hyphae, which in many species are capable of penetrating organic matter. Some specialist consumers of fungi possess piercing, sucking stylets (e.g. the nema-tode Ditylenchus) that they insert into individual fungal hyphae. However, most fungivorous animals graze on the hyphae and consume them whole. In some cases, close mutualistic relationships exist between fungivorous beetles, ants and termites and characteristic species of fungi. These mutualisms are discussed in Chapter 13. Note that microbivores consume a living resource and may not be subject to donor-controlled dynamics (Laakso et al., 2000). In a study of decomposition of lake weed and phytoplankton in laboratory microcosms, Jurgens and Sala (2000) followed the fate of bacteria (decomposers) in the presence and absence of bacteria-grazing protists, namely Spumella sp. and Bodo saltans (microbivores). In the presence of the microbivores, there was a reduction of 50-90% in bacterial biomass and the bacterial community became dominated by large, grazer-resistant forms including filamentous bacteria. The larger the animal, the less able it is to distinguish between microflora as food and the plant or animal detritus on which these are growing. In fact, the majority of the detritivorous animals involved in the decomposition of dead organic matter are generalist consumers, of both the detritus itself and the associated microfloral populations. initial shredding of plant remains. By their action, they may bring about a large-scale redistribution of detritus and thus contribute directly to the development of soil structure. It is important to note that the microfauna, with their short generation times, operate at the same scale as bacteria and can track bacterial population dynamics, whilst the mesofauna and the fungi they mainly depend on are both longer lived. The largest and longest lived detritivores, in contrast, cannot be finely selective in their diet, but choose patches of high decomposer activity ( J. M. Anderson, personal communication). Long ago, Charles Darwin (1888) estimated that earthworms in some pastures close to his house formed a new layer of soil 18 cm deep in 30 years, bringing about 50 tons ha-1 to the soil surface each year as worm casts. Figures of this order of magnitude have since been confirmed on a number of occasions. Moreover, not all species of earthworm put their casts above ground, so the total amount of soil and organic matter that they move may be much greater than this. Where earthworms are abundant, they bury litter, mix it with the soil (and so expose it to other decomposers and detritivores), create burrows (so increasing soil aeration and drainage) and deposit feces rich in organic matter. 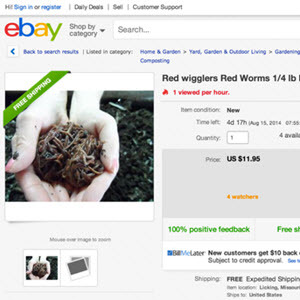 It is not surprising that agricultural ecologists become worried about practices that reduce worm populations. Detritivores occur in all types of terrestrial habitat and are often found at remarkable species richness and in very great numbers. Thus, for example, a square meter of temperate woodland soil may contain 1000 species of animals, in populations exceeding 10 million for nematode worms and protozoans, 100,000 for springtails (Collembola) and soil mites (Acari), and 50,000 or so for other invertebrates (Anderson, 1978). 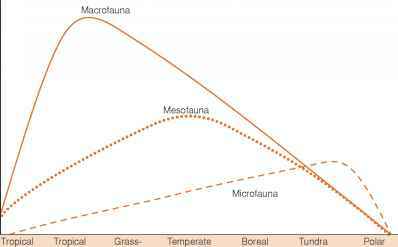 The relative importance of microfauna, mesofauna and macrofauna in terrestrial communities varies along a latitudinal gradient (Figure 11.4). The microfauna is relatively more important in the organic soils in boreal forest, tundra and polar desert. Here the plentiful organic matter stabilizes the moisture regime in the soil and provides suitable microhabitats for the protozoans, nematodes and rotifers that live in interstitial water films. The hot, dry, mineral soils of the tropics have few of these animals. The deep organic soils of temperate forests are intermediate in character; they maintain the highest mesofaunal populations of litter mites, springtails and pot worms. The majority of the other soil animal groups decline in numbers towards the drier tropics, where they are replaced by termites. Lower mesofaunal diversity in these tropical regions may be related to a lack of litter due to decomposition and consumption by termites, reflecting both low resource abundance and few available microhabitats ( J. M. Anderson, personal communication). 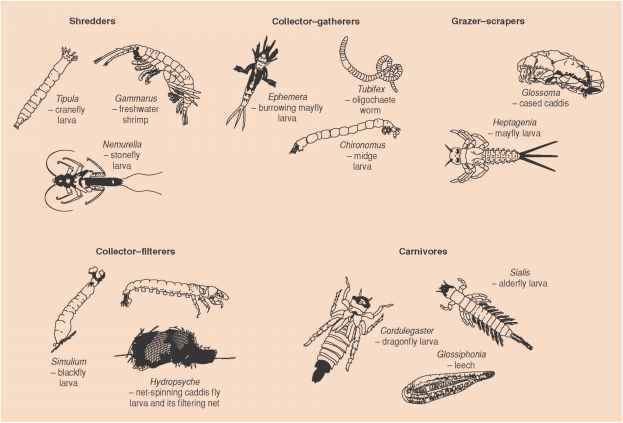 Figure 11.5 Examples of the various categories of invertebrate consumer in freshwater environments. the rate of decomposition and, moreover, the thickness of water films on decomposing material places absolute limits on mobile microfauna and microflora (protozoa, nematode worms, rotifers and those fungi that have motile stages in their life cycles). In dry soils, such organisms are virtually absent. A continuum can be recognized from dry conditions through waterlogged soils to true aquatic environments. In the former, the amount of water and thickness of water films are of paramount importance, but as we move along the continuum, conditions change to resemble more and more closely those of the bed of an open-water community, where oxygen shortage, rather than water availability, may dominate the lives of the organisms. In freshwater ecology the study of detritivores has been concerned less with the size of the organisms than with the ways in which they obtain their food. Cummins (1974) devised a scheme that recognizes four main categories of invertebrate consumer in streams. Shredders are detritivores that feed on coarse particulate organic matter (particles > 2 mm in size), and during feeding these serve to fragment the material. Very often in streams, the shredders, such as cased caddis-fly larvae of Stenophylax spp., freshwater shrimps (Gammarus spp.) and isopods (e.g. Asellus spp. ), feed on tree leaves that fall into the stream. 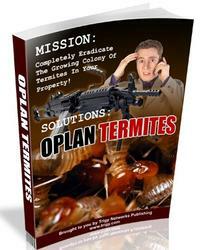 Collectors feed on fine particulate organic matter (< 2 mm). Two subcategories of collectors are defined. Collector-gatherers obtain dead organic particles from the debris and sediments on the bed of the stream, whereas collector-filterers sift small particles from the flowing column of water. Some examples are shown in Figure 11.5. Grazer-scrapers have mouthparts appropriate for scraping off and consuming the organic layer attached to rocks and stones; this organic layer is comprised of attached algae, bacteria, fungi and dead organic matter adsorbed to the substrate surface. The final invertebrate category is carnivores. Figure 11.6 shows the relationships amongst these invertebrate feeding groups and three categories of dead organic matter. This scheme, developed for stream communities, has obvious parallels in terrestrial ecosystems (Anderson, 1987) as well as in other aquatic ecosystems. Earthworms are important shredders in soils, while a variety of crustaceans perform the same role on the sea bed. On the other hand, filtering is common among marine but not terrestrial organisms. Figure 11.6 A general model of energy flow in a stream. A fraction of coarse particulate organic matter (CPOM) is quickly lost to the dissolved organic matter (DOM) compartment by leaching. 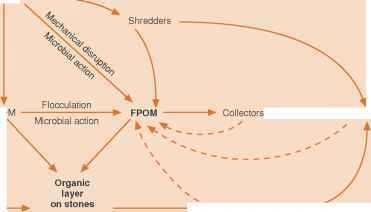 The remainder is converted by three processes to fine particulate organic matter (FPOM): (i) mechanical disruption by battering; (ii) processing by microorganisms causing gradual break up; and (iii) fragmentation by the shredders. Note also that all animal groups contribute to FPOM by producing feces (dashed lines). DOM is also converted into FPOM by a physical process of flocculation or via uptake by microorganisms. The organic layer attached to stones on the stream bed derives from algae, DOM and FPOM adsorbed onto an organic matrix. The feces and bodies of aquatic invertebrates are generally processed along with dead organic matter from other sources by shredders and collectors. Even the large feces of aquatic vertebrates do not appear to possess a characteristic fauna, probably because such feces are likely to fragment and disperse quickly as a result of water movement. Carrion also lacks a specialized fauna - many aquatic invertebrates are omnivorous, feeding for much of the time on plant detritus and feces with their associated microorganisms, but ever ready to tackle a piece of dead invertebrate or fish when this is available. This contrasts with the situation in the terrestrial environment, where both feces and carrion have specialized detritivore faunas (see Sections 11.3.3 and 11.3.5). Some animal communities are composed almost exclusively of detri-tivores and their predators. This is true not only of the forest floor, but also of shaded streams, the depths of oceans and lakes, and the permanent residents of caves: in short, wherever there is insufficient light for appreciable photosynthesis but nevertheless an input of organic matter from nearby plant communities. The forest floor and shaded streams receive most of their organic matter as dead leaves from trees. The beds of oceans and lakes are subject to a continuous settlement of detritus from above. Caves receive dissolved and particulate organic matter percolating down through soil and rock, together with windblown material and the debris of migrating animals. What are detritivores animals in the ocean? What bacteria are ocean detritivores? What animals depend on detritivores? 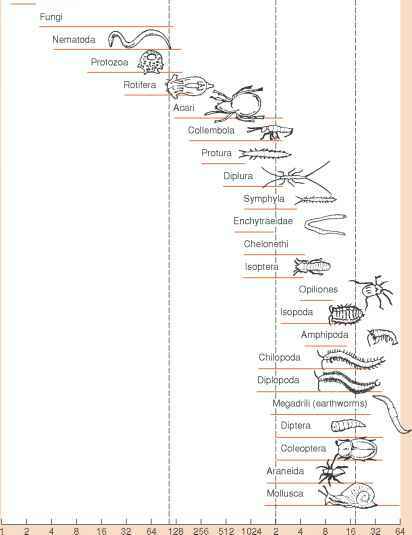 Which are the insect detritivores? Which layer of soil contains the decomposers and detritivores? What is an example of detritivore? Which layer of soil contains decomposers and detrivores? 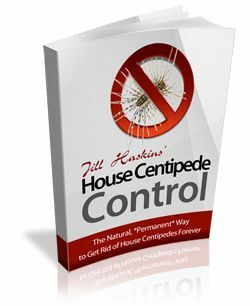 Is centipede an example of detritivore animals!? How microbivores are moved into the body? Is bacterium the examples of de tritivore? What are some decomposers in the desert? Why microbivores are important in the process of decomposition? What is a animal that is Detritivores? What are the two main categories of detritivores?